We’re happy to tell you that EF finally finished the recordings of “Delusions of grandeur“. The bands new 10″ vinyl EP to be released in September by German label Pelagic Records and will become a part of their family together with God Is An Astronaut, The Ocean, Abraham, Lo! and many others. 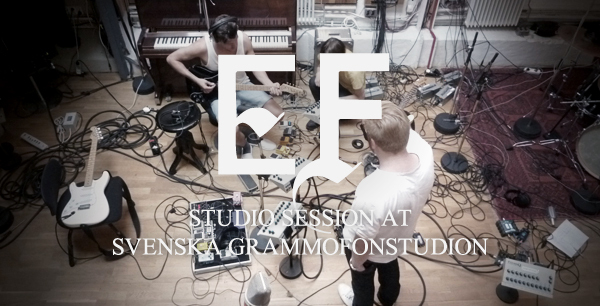 EF was locked up over at Svenska Grammofonstudion for almost a week. A legendary studio where many of top international bands/artists recored as well as some of Swedens best exports such as Jose Gonzales, Shout Out Louds, Millencolin and The Haunted have chosen for some of their best albums. The band recorded almost day and night to finish in time and cooperated with Oskar Lindberg for the very first time. Oskar was nominated for two Swedish grammy last year and recorded albums with Soundtrack of our lives and I’m from Barcelona but also Swedish indie/postrock-outfit Jeniferever. We felt they were in good hands and could get some new input. Magnus Lindberg finished the project and mixed/mastered the three songs – who also handled the “Mourning golden morning” recordings in 2009/2010. We dare to say that this is some of the best pieces of music we’ve heard from the band – and we think it will break some new ground. Still the solid EF-pop melodies, the atmospheric soundscapes and the explosive energetic pieces to create a superb 25minutes of dynamic indie/pop/postrock/whatever. Previous postEF New release & new tour! Next postEF vinyl teaser and pre-order!